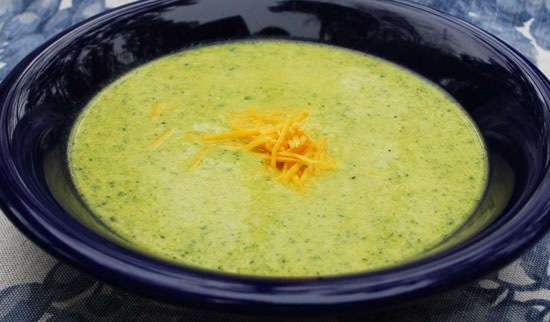 It was such a cold, windy day yesterday I was glad I scheduled Broccoli Cheese soup for dinner! It was very good! This is the recipe I decided to share today. I didn’t use a bread bowl (though that would have been delicious!). I also took my broccoli and carrots and and fine chopped them in my new Ninja Master Prep Professional. (Side note: That is a cool device! My blender of about 15 years finely bit the dust and I had to buy another one. I checked out many brands and found the Ninja had the best reviews. I love it because it acts as a blender and food processor. It came with three different size pitchers with lids and four different blades to blend, chop, mix and puree! Great kitchen tool!) Anyways, I pureed my carrots and broccoli before I added them to my soup. I also took some broccoli and cut them into some small chunks and put them in the soup. I added a little more flour to make it a bit thicker. Besides that it was really good and satisfying! Enjoy! In a large stockpot ( I accidentally used a medium-size pan) – melt butter. Add flour and mix for 3 minutes. Slowly add half- half – mixing the entire time. Let simmer on low for 20 minutes. Add broccoli, carrots; onions and cook on low for 25 minutes.